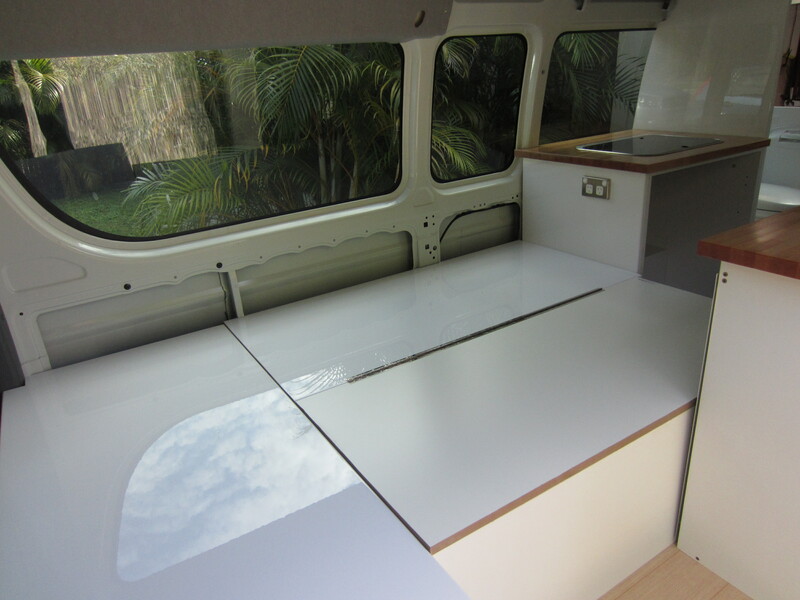 After much pencil chewing and imaginary beard stroking over how to convert our campervan seating into a bed, Paul had an epiphany. 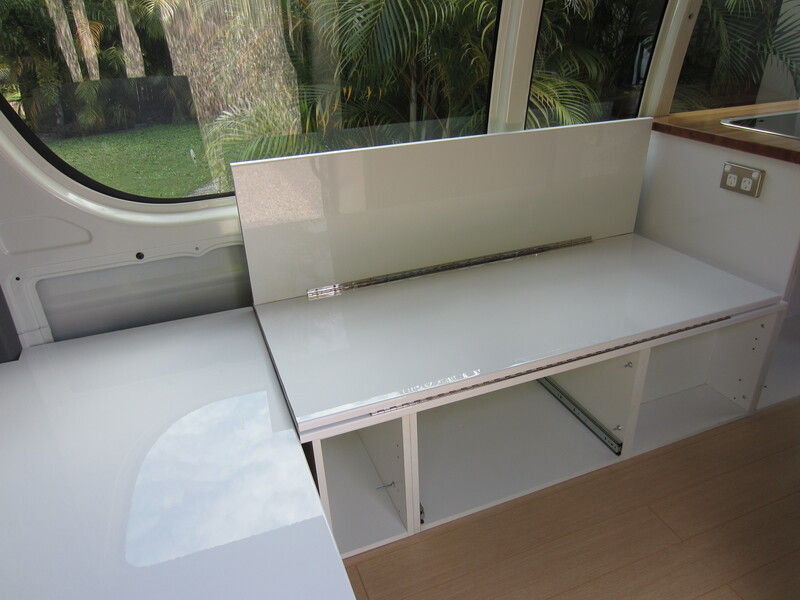 Paul had to cut the top panel marginally shorter than the bottom one, so it would clear the overhanging worksurface when pulled out. This will be hidden though once the seat cushions are on. 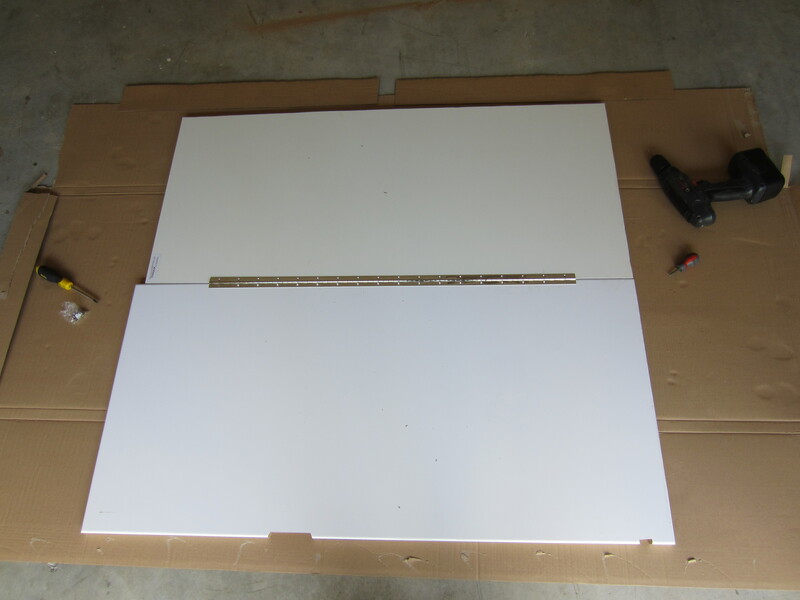 We’ve continued to use the same material for all the seating panels – I imagine the staff at Bunnings are somewhat intrigued by the sudden demand for their cheap pantry doors. 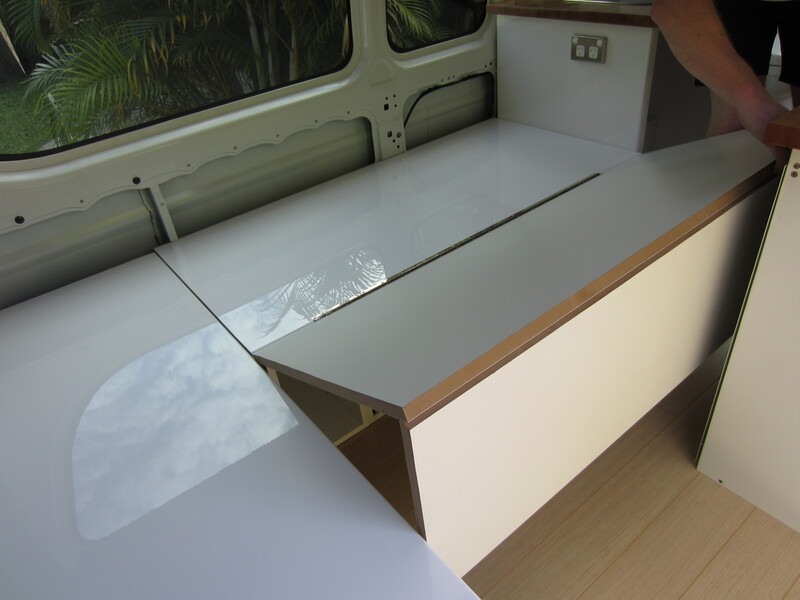 It’s been a readily available form of MDF though with a glossy plastic coating, and has been really easy to work with. In the bed configuration, the two seat cushions will stay in position, and the two backrests will lie side by side on the other half. The bed is actually wider than I’d imagined; I was visualizing us both having to lie on our sides and turn over in unison, but it’s about 1.2m wide, which is fairly comfortable. This week Paul has also fitted the master control switch, and bought the battery and the charger, so the next job is to start wiring everything up. Since winter arrived early in Brisbane, I have been lobbying for a nice warm fan heater, in case the van is finished before August. I’ve been advised to just rug up. 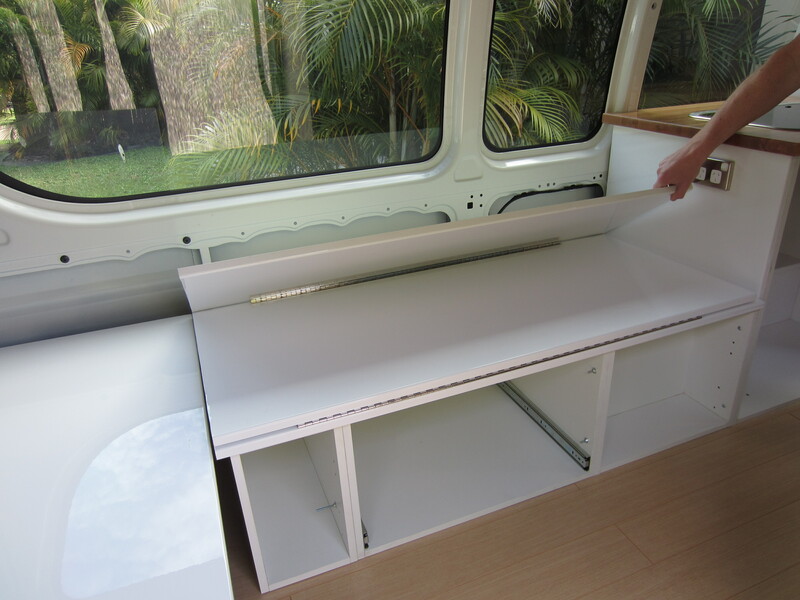 This entry was posted in Building a diy campervan, Campervan seating/bed conversion and tagged Bunnings, campervan bed, Campervan conversion project, campervan cushions, campervan furniture, Campervan photos, campervan seating, convert seat to bed, Converting a campervan step-by-step, DIY campervan, how to convert campervan seating into a bed by Rach. Bookmark the permalink. Looking impressive – I can see it now……………. Both Renata and I are waiting in anticipation to see the completed cushion covers etc that you’re working on. I know you’ve been busy with all these posts etc and keeping Paul fed and energised for his weekly campervan work-out! But when will we see your beautiful work? Looking forward to seeing the van. Paul seems busy! …where are there cushions? I think Paul is doing a great job and Rachel doing a great job on the blog, but I’m not sure when she’ll get round to doing the cushions etc!! Need to see some more progress and photos please. Hope to see you guys soon too. Thanks so much for sharing all of this invaluable information. 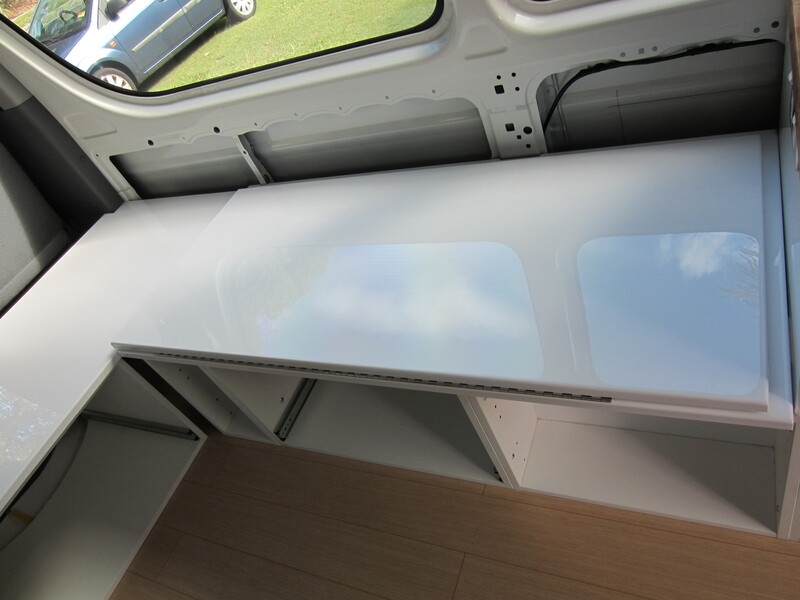 We have a Mitsubishi L400 4WD van with a conversion that we are not happy with. I’ve scoured millions (okay maybe slight exaggeration) of websites looking for the right conversion for us, and I think this is it! Well done for getting a bathroom in there as well…I’m so impressed with that! Was there any reason you didn’t add a pop-top other than the expense of it? Hi Rachel, did you have any issues with the fold out panels not being supportive enough for you to sleep/sit on? Hi Gabriela, I’m so sorry for my late reply on this one, for some reason the comment has only just come through. It’s probably too late for you now but we didn’t have any problems at all – the supporting leg did its job and it made a very sturdy and comfortable bed.